Much like the real life subjects upon which it’s characters are based, Terre Haute is a rather interesting play. 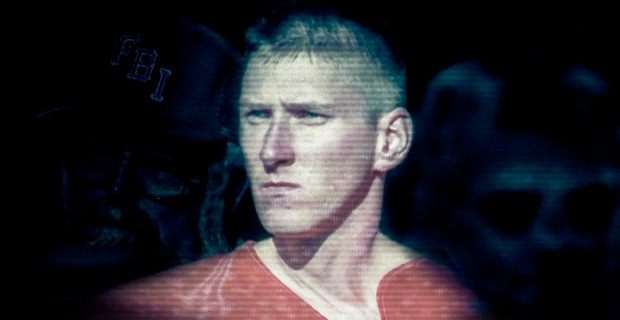 Based on the correspondence between Gore Vidal and Oklahoma City bomber Timothy McVeigh (represented here by two differently named but otherwise identical proxies), the play imagines a meeting between the two figures at the Terre Haute Correctional Complex just days before the McVeigh character (renamed Harrison for the play) is about to be executed. While the staging is spare, director Alistair Newton makes an interesting and effective choice of rotating the set with each new scene so that we as an audience see the set from different perspectives, much like Vidal stand in James Brevoort wants to examine Harrison from a different perspective. In examining the political motivations of Harrison as well as the differences and similarities between the two men, Terre Haute certainly offers up much food for thought and while the play doesn’t shy away from the ugliness of the bombing (or “the events,” as Harrison prefers to call it), it does present the bomber as a somewhat sympathetic and even likeable character at times. This is accomplished not just through the writing but through the performance of Todd Michael Sandomirsky. Both he and Terence Bryant fully inhabit their characters and help to make this an entertaining and thought provoking performance.